This book researched into the political legitimacy of the Islamic Civilization, that has utilized the texts of revelation and the historical experience of the Muslims as the main aim in alleviating them from their political crisis. The realms of politics are multi-layered and have been elaborated with certain details in a few verses of the Qur’an and hundreds of authentic hadith of the Prophet. Unfortunately, the principles in politics which are replete with religious texts are still scarce as compared to what have been applied institutionally and executed in the history of Muslim civilization. What is meant by the constitutional crisis of Islamic Civilization is the apparent difference between the Islamic political principles and the reality of the political history wherein the Muslims have to engage and carry the heavy burden. Similarly to what had materialized from the apparent differences that have resulted from the discourses of bleak political history of the Islamic Civilization starting way back from the early years, half a century after hijrah, until this day. 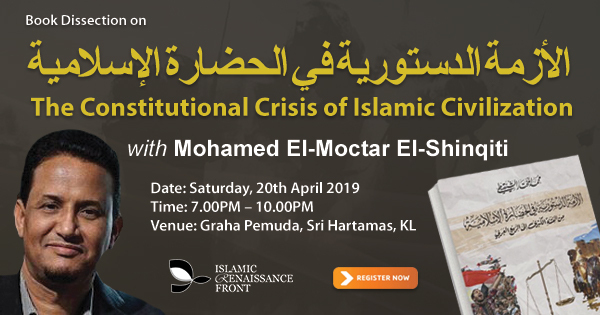 Mohamed El-Moctar El-Shinqiti is an Associate Professor of political ethics and history of religion at Hamad Bin Khalifa University (Doha, Qatar). He got his Ph.D. in history of religion from Texas Tech University (USA). His academic interests include philosophy of religion, political philosophy, religious reformation, and religious sectarianism. Political Discords among the Prophets' Companions. A Philosopher of the Holy Qur'an: Muhammad Abd Allah Draz, His Life and Achievements. Wounds of the Soul (a poetic collection). "Defensive Jihad: Islamization of the Turks and Turkification of Islam." Most of his works were translated into Turkish Language. Some were translated into French, Persian, Albanian, Bosnian, Kurdish and Tamil. As a political analyst, he is a regular contributor with Al-Jazeera TV Channel, and with its website www.aljazeera.net where he published hundreds of analytical articles.